The past week has been filled with new analysis on the market, which revealed a mixed bag of future expectations. OPEC released their monthly report, increasing their expectations of non-OPEC supply while slightly increasing demand expectations as well. On the other hand, the International Energy Agency (IEA) raised their demand forecast by 100 kbpd in 2018 while decreasing their OPEC supply expectations, which would be more supportive for prices. The tie-breaker would be the EIA report, released last week, which shows markets net over-supplied in 2018. Two big political questions hover over the price outlook. The current fundamentals suggest prices may fall slightly lower, perhaps dipping below $60 in the next few months. However, with Mike Pompeo taking over the Secretary of State position, markets could wait just a bit longer to see how he acts. The two big concerns for oil markets is Iran and Venezuela. Mike Pompeo supports exiting the nuclear deal, which would re-impose sanctions on Iran’s economy and oil production, and he’s also argued for imposing more sanctions on Venezuela. The net effect of these two policies could cause up to 1.4 million barrels of oil to be pulled off the market, according to a Platt’s article. 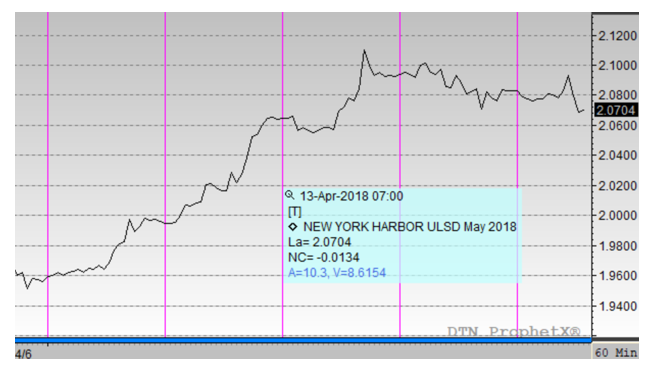 May 12 is the deadline for the next sanctions waiver on Iran – markets may maintain today’s higher levels until then as markets take a “wait-and-see” approach to political risk factors. Crude prices appear set to end the week in the red. Crude oil opened at $62.10 on Monday, and today prices opened about a dollar lower at $61.19. The decline earlier in the week as markets began to tire, but Wednesday’s inventory report gave prices a shot in the arm. Despite a large crude inventory build, refined products saw huge draws, supporting the overall oil complex. Political questions related to Mike Pompeo’s nomination to Secretary of State should continue to provide support to crude prices in the near future. Unlike crude prices, diesel is in the black, with markets gradually rising throughout the week. While crude prices fell on Tuesday following the API report, refined fuels were able to recover and trend higher, keeping them higher for the week. The EIA reported a sizable 4.3 million barrel draw on Wednesday, keeping prices supported for the latter-half of the week. Diesel prices began the week at $1.8860, and today prices opened at $1.8929. Prices are currently bumping up against the $1.90 threshold, trying to break higher and perhaps make a run to $2.00 like they did earlier this year. Like diesel, gasoline is rising higher this week, gaining over 2 cents this week. While not an outstanding increase, it is the largest gain of the week, rising despite crude prices declining. 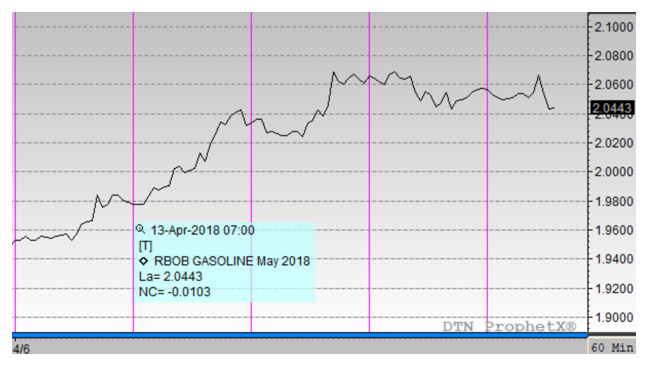 A whopping 6.3 million barrel draw from gasoline inventories across the U.S. contributed to the three cent gains seen on Wednesday, and prices have been hovering between $1.92 and $1.93 since then.